Ithaca College Gives Zuckerberg Sister a Big "Like"
12/8/2011Share this story on Facebook! 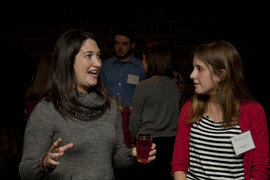 Randi Zuckerberg speaks with Park Scholar Lindsay Smith '14 prior to the event. Learn more about some of IC's past speakers and visitors. Want to create the next Facebook or Twitter? IC's latest innovative major in emerging media will incorporate computer science, marketing, communications, and all of the tools needed to become the next Randi Zuckerberg. Ithaca College was especially buzzing with social media updates Nov. 30. The word on the "tweet?" Randi Zuckerberg, former Facebook marketing director and older sister to Mark Zuckerberg was coming to IC. The Internet entrepreneur came to the College as part the Roy H. Park School of Communications Distinguished Visitor Series, speaking to a large crowd in Emerson Suites and several small groups of students throughout the day, discussing everything from cyber bullying to social media’s impact on the revolutions in Egypt. “It was probably the most tweets and Facebook messages I’ve ever received going into a speaking engagement,” Zuckerberg said during her speech. Diane Gayeski, dean of the Park School, introduced Zuckerberg, encouraging students to leave their "virtual world" of news feeds and status updates. Zuckerberg says she was particularly amazed with the conversations she had with students and that social networks like Facebook have inspired the creation of a new emerging media major at IC, which caters a curriculum to students who hope to create the next social innovation. "I was impressed with how you're starting to think about everything from your personal brand to privacy to just the impact social media has on the rest of the world," she says. "You're thinking about things that I never even dreamed to think about when I was in school." After graduating from Harvard, Zuckerberg spent a few years working at an advertising agency and then at Forbes before joining her brother at Facebook. As the marketing director for the social network, Zuckerberg had a variety of opportunities, from picking the company's now signature logo to leading a live stream of the Presidential Inauguration. Zuckerberg left Facebook six months ago to start her own company called R to Z Media, which helps businesses effectively use social media. She plans to officially launch the company next year. From telling authentic stories to creating a loyal fan base, Zuckerberg gave her top 10 tips and trends in social media, advising students to constantly think how they make something "more social." To conclude her speech, Zuckerberg emphasized the major role social media now plays in current events and everyday life.